Phytoplankton refer to minute sea creatures that provide nutrition to thousands of different types of ocean life. As a supplement, phytoplankton is rich in 10 amino acids, omega-3 fatty acids, B vitamins, vitamin A; plus minerals such as zinc, copper, magnesium, manganese, potassium, sodium, calcium and iodine. 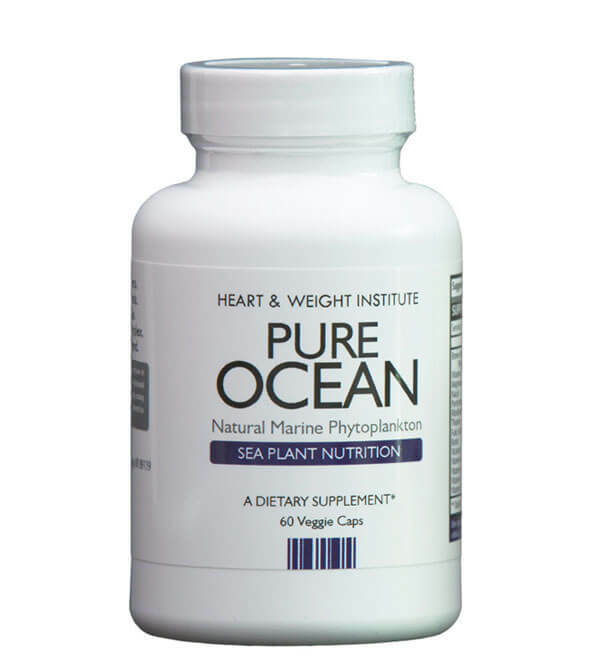 Pure Ocean contains hundreds of different carotenoids, minerals, amino acids and nutrients. And compared to land-based plants (which are usually mineral deficient), ocean-based plants are naturally rich in ocean water minerals, including all the trace minerals that can prevent and reverse serious disease. Spirulina is a simple, one-celled organism that got its name from the Latin word for ‘helix’ or ‘spiral’ because of its spring-like physical characteristic. spirulina is a potent “superfood” high in protein. Liver Support: The Arginine in this superfood is known to assist in liver detoxification. It will go right through the liver, and into the blood stream. Improves Brain Function: The high amount of omega-3 fatty acids improve brain function. The nucleic acids can enhance the memory. Phenylalanine improves mental clarity. Proline increases learning ability. Magnesium helps reduce mood swings. Other Ingredients: Certified organic Vegicaps® vegetable cellulose capsules. Pure Ocean also contains trace amounts of calcium, copper, iron, manganese, magnesium, phosphorus, sodium, carbon, cesium, cerium, chromium, cobalt, gallium, iron, lithium, manganese, phosphorus, silicon, sulfur and zinc.